You can return to our malvern spring show page or browse the pictures using the next and previous links. Here come the flowers! This is another plant from the Malvern Show. I love it! Oh dear, Louise. Too late! I guess you could google it?? And when you do please let us all see them. I've never seen a bloom quite like it with that snakes tongue shaped petal. The other two have this shaped flower, as well - only white! ~try this nursery~they have a few nice ones! They do indeed! I have the Nursery on my 'favourites' list! I just took a look - did you see 'Black Ruby' at Malvern?? ~very nice but I really like Musgrove pink and Cherry Pie~will be ordering those! 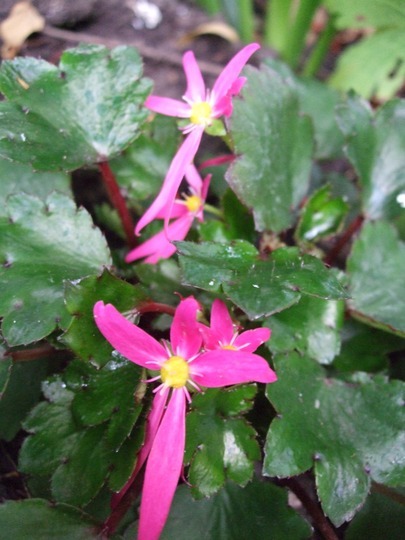 See who else is growing Saxifraga fortunei. See who else has plants in genus Saxifraga.